So, you have a problem with your Windows Update and you ran the Windows Update Troubleshooter downloaded from Microsoft website. Instead of fixing the issue, the troubleshooter returns an error that reads “Potential Windows Update Database Error Detected 2018 Windows 10“. The potential Windows Update database error detected 2018 Windows 10 error suggests that there were potentially database error during Windows Update in Windows 10. Usually, this error could happen when there are corrupted Windows system files, or when Windows update have problem accessing to the C:\Windows due to corrupted files or bad registry entries. 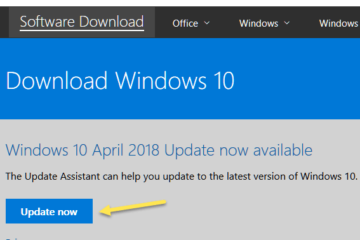 Thus, when you run Windows Update troubleshooter, you may get the potential Windows Update database error detected not fixed Windows 10 2018 error, or sometimes Windows Update components must be repaired. Here’s how to fix it. Since the error is most likely to be caused by corrupted or missing system files, we will run a series of repair tools trying to repair the corrupted files in Windows 10. We will also try to run another troubleshooter and restart Windows Update service. If nothing works, we would suggest you to reset Windows 10 without losing files. Read below for instruction. System file check is a powerful Windows 10 built-in tool to automatically scan and repair missing and corrupted Windows system files. 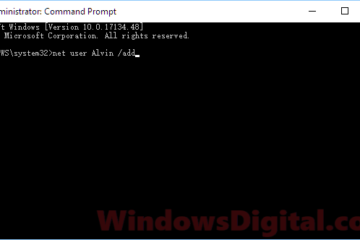 Here’s how to run the tool via Command Prompt. Go to Windows search or start menu. Right-click Command Prompt from the search result and then select Run as administrator. In the command prompt, type the following command and press Enter key. Sit back and wait while the system file check does it job. It may take some time to scan your system files depending on the size of your system files and the performance of your HDD. When it’s done, restart your computer and run Windows Update troubleshooter again. If it shows no error, run Windows Update to see if it works. 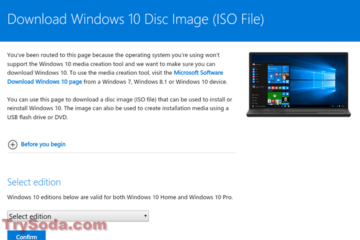 DISM is another Windows 10 built-in tools capable of repairing Windows 10 image and correct Windows Update and other services’ problems. It’s also one of the most widely used and the possibly the second tool (after SFC) that come to mind first when we meet a Windows 10 error. To run DISM, open Command Prompt with admin privilege as instructed above. In the CMD, enter the following command. DISM may also take a long time to complete its scan and repair. When the scan is completed, restart your computer and verify if the potential Windows Update database error detected 2018 not fixed in Windows 10 error still persists. Instead of using the WU troubleshooter you downloaded earlier, try to run the built-in troubleshooter from Windows 10 settings. 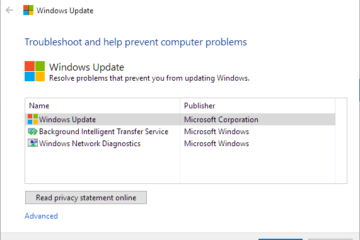 Here’s where you find the Windows Update troubleshoot option in Settings. Go to start menu. Click on Settings which appears as a gear icon at the left. Select Update & Security. From the left pane, click on Troubleshoot. 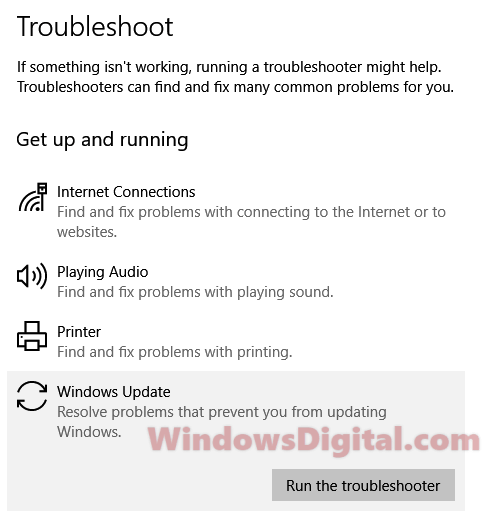 Select Windows Update under Troubleshoot, then click on the Run the troubleshooter button. If nothing works, we suggest to reset your Windows 10. By reset, it means to reinstall Windows 10 entirely. 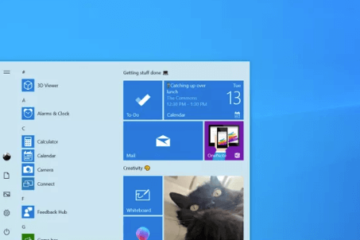 The new reset Windows 10 method allows users to keep their files so that you won’t lose your files during the reset. Here’s how to do it. Go to start menu. Click on Settings, then select Update & Security. Click on Recovery from the left panel. Under reset this PC, click on Get started. Follow the on-screen instruction to complete the reset. 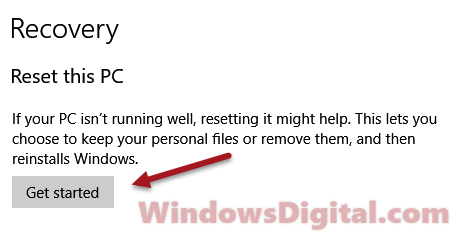 Make sure to select keep my files if you prefer to keep your personal files when Windows 10 reset. If in any case you can’t boot into Windows, you may want to read: How to reset Windows 10 without losing files. Resetting your Windows 10 should solve the potential Windows Update database error detected 2018 not fixed in Windows 10 error. 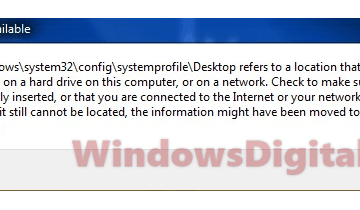 Description for sharing: When you run Windows Update troubleshooter and it returns "Potential Windows Update Database Error Detected 2018 not fixed in Windows 10" error, here's how to fix it.